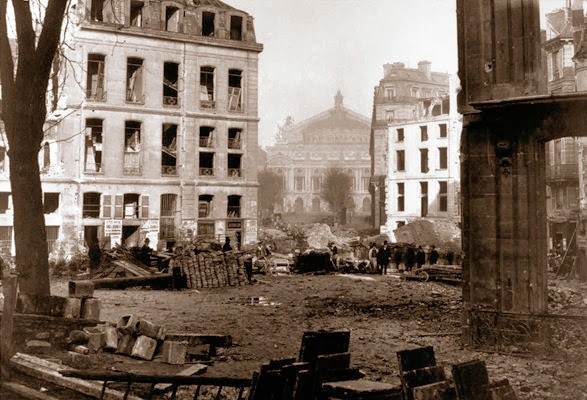 Well, it was only a matter of time till I would mention Baron Haussmann (George Eugène Haussmann), the baron who restructured the entire city of Paris in the 19th century under Napoléon III, giving it both the layout and the look that we have all come to think of as the "true" Paris. I myself have never read any book on Paris that doesn't mention him and was kind of hoping to give the baron a rest. But once in a while we have reason to think about architecture, and life on the noble floor -- l'étage noble, that is. 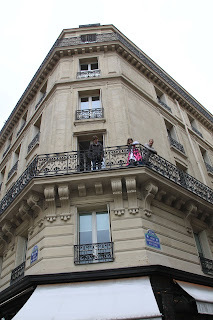 Walking around Paris, you will quickly notice that the typical structure of a building is small balconies on the 4th and 5th floors, with a bigger one on the 6th floor. But the biggest and grandest of all is on the 3rd floor, l'étage noble. The reason for this dates back even before the baron's time: The entry level was where the carriages would have pulled in to let you off and where sewage flowed by. One floor up was still quite close to the (stinking) ground level. But the 4th floor and beyond was an unpleasantly long walk, in those days with heavy long clothes and before elevators. So the 3rd floor was the Goldilocks floor: not too high, not too low, and just right. Once the baron more or less codified this style of building, which housed varying socio-economic levels under one roof, l'étage noble earned its name and its reputation for housing the wealthier citizens. The highest floors may have better views, but they are risky, since elevators were only introduced in Paris in the 1870s, and even today in 2012 are still generally tiny, retrofitted, and, as we know from an early experience, highly unreliable. Hence, the compromise on the 6th floor of a big balcony with a view but one that is not-quite-as-big-and not-quite-as-easy-to-reach as l'étage noble. The highest floor -- small dormer windows in the 7th floor, usually -- are the maid's quarters, now often transformed into high-priced but still-small student rooms or studios or added by staircase to the 6th floor "penthouses." 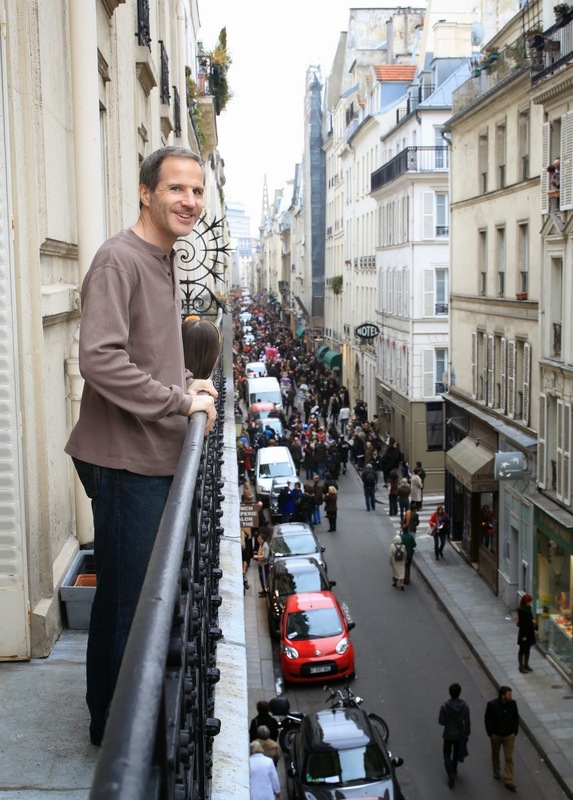 We don't normally think much about the fact that we live on l'étage noble, but during our first March here, we notice a rather large crowd gathering on the bridge and street outside our window. We head out to our balcony, which wraps around the building to get a good view, and are met by the unexpected scene of a Venetian-themed carnaval procession slowly meandering its way toward us. We seem to be the only people looking at this spectacle from above. It's the sort of happy accident that makes traveling -- or in this case simply living -- overseas feel like a delightful adventure. But noble floor or not, let's face it: If ever there were somebody who's a plebeian at heart, it's me. I am bursting to go down to ground level and rub (read: bonk) elbows with the masses (read: photographers) for these photos. 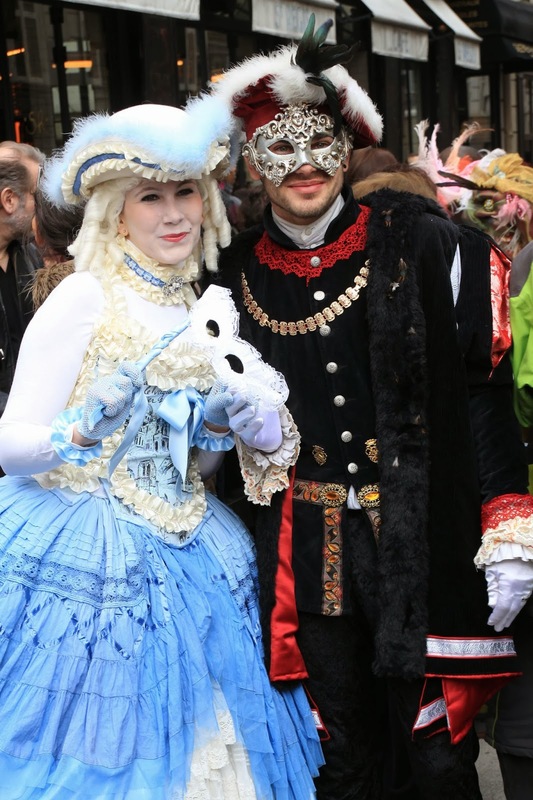 I've read a critique of this Venice-themed carnaval as being too contrived and "inauthentic," but I just don't care. It's colorful and celebratory, and I'm simply not cynical enough to say anything negative. For us, it is so much fun to look out our window and discover this parade! Pippa cannot resist dressing up in her own purple princess costume, and her French friend who lives in the neighborhood shows up in a princess costume as well. At the time, they are first graders, and Pippa is officially out of her princess phase and deep into her fairy phase. But if this is not the perfect opportunity to parade around the streets in a foofy royal robe, what would be? Clearly, it's not just the children, because these adults can't resist the temptation to play dress up, either. The only sad thing is that because of the expense, the parade hasn't been repeated in the years since. But nothing will ever quite remind us as much of what it means to live on l'étage noble. Chaussée aux Moines is an industrial cheese made from pasteurized cow's milk in the Mayenne department of France. For such an ancient-sounding-name, the cheese is actually relatively new and was only created in 1983. It's a semi-hard cheese. The crust is waxy, a result of being pressed and aged in a cloth, and I can't imagine anybody enjoys eating it. I know I don't. Then again, I'm not a huge fan of the cheese itself; it's rubbery, and without much character or flavor. The name "Chaussée-des-Moines" means "Carriageway (or Roadway) of the Monks," but I'm not really sure why it's called that. It looks more like it should be called a "Tête de Moine" ("Monk's Head"), but they couldn't call it that because that's a classic cheese that already exists, made in Switzerland. There is nothing monk-like about this Carnival. And the cheese is far too plebian and bland for the colorful Mardi Gras parade. But in France, the floors are numbered differently, so that the Noble Floor, which is the 2ème étage, is what we would call the 3rd floor in the US. For the ground floor, which the Americans call floor 1, the French have a separate term: rez-de-chaussée. Word for word this means "floor-of-carriageway" or "floor-of-roadway" which explains a lot. And so, though I look down on the rez-de-chaussée (literally, from my apartment) and this cheese (snobbily, compared to other cheeses), it seems fitting to pair this cheese with this posting.